I believe in old is gold! There are certain things that we can’t stop appreciating, however old or ruin they are and unused for ages, remain nostalgic whenever thinking about. I have a mind that does not give away certain things easily esp. used for long term or still feel content with quality and usage rather being old. During my childhood or young days, one could see me roaming on the streets with friends and go rounds often in our area… and while this course we used to find many interesting little things on road and my favorite place of picking things was Kailankadai (old iron shop). I had my own table drawer then where I used save things I brought from the shop and streets. My mother used to scold me for bringing those useless things to home and often engaged in war with brother for stealing one or two things. I never listened to her and kept saving those things and since my uncle had workshop adjacent to our house, I used to pick things from there as well. I had a collection of small iron balls in various shapes exists from the bearings until my brother swallowed one of it accidently. I think I had few of them even after shifted house for first time and I am interested even now if I get chanced to pick things at Kailankadai. I know there is no future for broken arrows but we can do many things using those pieces. What is useless to someone could be utilized to other. Let me come to the matter of old things, which I still hold without use. I know tape-recorders and cassettes has no more futures and almost settled as sediments underwater leaving way to light and transparent technologies let move into air. The CDs and players has also become old stock with blue-rays and “I” series looking out for more light waves to wash away. My passion for old and useless things comes out objecting the idea of mom’s proposes to dispose our old tape-recorder and a box full of cassettes. I don’t know why and I am not going to listen to them anyway, but there’s something rolls me with the reels here. Until I bought my first CD player in year 2002, the tape-recorder was my only source of music and it was a foreign set bought to me by my late uncle, replacing the Philips tape-recorder with single speaker. I want to hold it back not because it was bought by my favorite uncle and it remain as a remembrance of him but apart being so, there was something that wants to keep it around. This tape-recorder enhanced my way of listening music with enough bass and treble effect unlike plain mono-stereo. 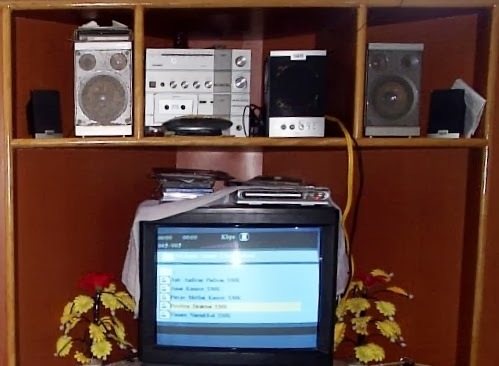 Even until I bought my home-theater, I was connected my CD and MP3 players to this tape-recorder speakers using AUX wire. I ever had trouble like using this set, which often get struck with reel and have to bear to electronic shop, where the electrician used to take more than a week and above to mend it after number of walks to his shop, just two houses away from us! Music always been my source of inspiration and uplifts my spirit when I feel down and there is nothing excitement like listening to new song or tune for first time that too from our favorite directors or actors. Until few years back I used to buy original CDs and cassettes from the music store, because for me quality is much important when it comes to music and movies… I can’t withstand the noise and sound disturbance. I know the tape is taking place enclose, but I have no mind to give away and not only the player there are few more things I kept safe in bureau. The house hunting has come to an end or we ended. The chaos related to house searching seems unending and we decided to put a full stop to the weariness and stress by choosing the best among the better exists. We aren’t content with any house during our search mission and being first time intended to search for a house rather unlike going with the heart of desire by how we chose the current residence... without much options of houses and within our budget we picked a house to relieve ourselves from the house tension. It doesn’t mean we couldn’t find a content house but what seems to fulfill our needs aren’t belong to us or forced to give away for certain reasons unmatched between us and owners. Except one or two, most of the apartments showed red signal for allowing pets and having pet is one specific reason that we couldn't get a house we wanted. The brokers who promise to finalize certain houses were all seems liars and actors, their intentions were only on getting commission rather listening what we say or owners convey. We didn't believe their words and we were also on our own search for houses since we have already said the owner that we quit house this month end, we have no time to wait and see further. So we decided to move into a house near Adyar Sishya School, even we aren't totally satisfied with the house it wasn't too bad to avoid or lack of comfort to reside. It was a duplex house and we are taking the ground portion. It was a very quiet and calm area except for being busy at morning and evening while the school open and close… cars seems to stand in long queue to drop and pickup students since almost students study here were from wealthy background. I was born and brought up in Adyar until we shift to apartment in Thiruvanmiyur, 8 years back, but it was my father who wants to let back to Adyar or close to our native house there because he was quite depend on Adyar for almost sufficient work. This house shifting is also gonna be a temporary one, not only because the owner has plan of demolishing the house and built a new one there after 3 years, we would also shift if we find a better one than this when the situation was favor. We have planned to shift home at the weekend and if done I won’t be able to blog or flickr for some time until reconnected with internet. It was the brokers who force us to end up the house hunt because being exhausted by their way of making wandering and showing the same house we have already shown by someone. Some brokers fear and hesitate to talk to owners in reducing the rent and they also have no clear idea about the facilities and only we have to convey them by talk with owners but what they want was, was only commission. By searching house, I think anyone could become a broker and what they do was, go through the classifieds and give separate Ads to the already exists by just mentioning his mobile number and area alone. So we can’t guess which is genuine and for a single house there are multiple brokers making turmoil. Rangoon creeper, also known as Chinese Honeysuckle and “Irangun Malli” in Tamil is a vine with red flower clusters that found in Asia and many other parts of the world either as a cultivated ornamental or run wild. The creeper seen rooted commonly only in a small hole in cemented ground, grown exactly the way it described at one of the corner of our house, thriving and climbing high on the Frangipani tree. The Rangoon creeper is a ligneous vine that can reach from 2.5 meters to up to 8 meters, has leaves that are elliptical with an acuminate tip and a rounded base. The clusters of flowers that are fragrant and tubular, opens white in color which changes to pink, red and finally to deep maroon. The plant grows on a support is very useful in covering fences and walls and the growth rate of the plant is generally fast and don’t make heavy fertilizer demand. Rangoon creepers being a vigorous twining climber, booms profusely throughout summer can reach as much as 70 feet in tropical climates. 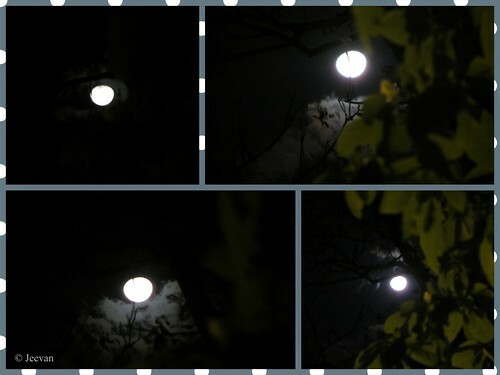 The creeper that does like medium to bright light is found in thickets or secondary forests of the Philippines, India and Malaysia. These pictures were shot in September 2013 and the picture above is a close-up macro on the flowers. an elegant beauty that enticed me. that get life and light through it. ascent under its silver shadow. Life is quite stressful and pain already, but the Oct 17th is a day I could not forget and also don’t want to remember which took me further into my future’s setback. Just a week early going into the cast for my femur fracture was quite terrible and it was a moment that ever in my life felt so painful and even an inch movement in leg touch the extreme. It was four month since (today) the incident happen and only I was able to visit the doctor on Friday even I was out in car twice. He was treating me from the home, looking at the x-rays which his staffs come and take at home; and only to wear the cast I went to his clinic in a small ambulance. I am quite well now and only my knee has to bend little more to sit much comfort… I am still unable to stand on my feet which enabled shifting me much easier from one place to another then. I feel little pain in my left knee only on which I could put strength and I also lack balance and fear to put much effect when attempting to stand with weak bone. The fracture wasn't in my bone alone; it also broke some comfort levels I enjoyed, which I am sure to lose sometime in future at step by step progress has skipping few steps all of sudden. I have planned a lot using the standing ability of mine esp. on traveling progress, which is the mainstream delectation in my life and I almost dream on traveling delight. What was my mindset exactly four months back wasn't quite same now, and I have to prepare myself to face the loss of ability and how to travel from shifting one seat to another. We own a SUV and using it for the last 6 years esp. because of the comfort level it provides to me and I could travel long distances without any difficulty in our car and now being unable to stand, I couldn't climb into it. I have only two options now on traveling, which was to change the car with low height or modify the SUV with Turny Swivel seat or place wheelchair lift at the rear. Right moment, we are in intense search of house and only two weeks were left to shift the home… parents were going thought great stress and headaches because of it. The house we hoped to occupy had dropped at last moment, as the owner of the house demands more rent out of our budget; we are now even looking at apartment’s rather independent houses where pets are allowed. Our entire thoughts are about getting a nice house right now and only then I could take the next step as altering my wheelchair into much comfort and modify the SUV. Why I much hold with SUV was, because it was the car I could take anywhere and it makes wonderful drive on any terrain except mud roads, I am more love with it as it is my favorite vehicle. I have traveled nearly all mountain passes of Tamil Nadu with this vehicle and I never experienced difficult with the car getting breakdown or spoil the plan. 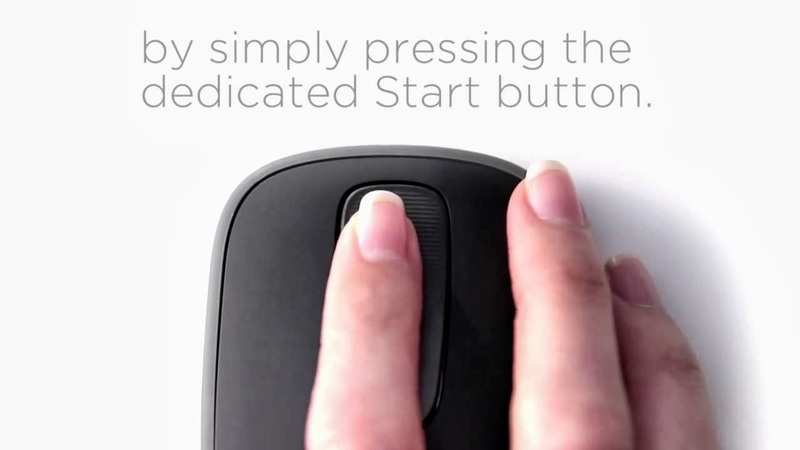 Do you agree mouse is convenient than touch pads in laptops? I feel quite comfort using it after a while get used to touch pads and touch screen. I think working with mouse is much faster than scratching the touch pad and I really wonder it is me alone feel such way or there are other who could agree. Dad bought me a touch mouse from Logitech and it was cool operating from the little space on my wheelchair tray, aside the laptop. The touch is available only for scrolling vertical and horizontal by swipe one finger and it also has buttons for start menu and desktop screen apart right and left buttons. and stroll on the sand? while sun kissed the sea. 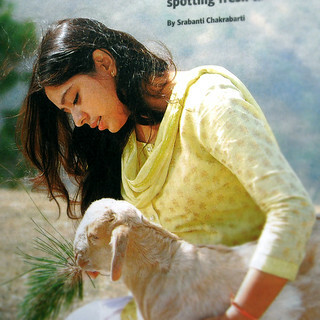 who’s very close to heart? It was about 12 degree Celsius in evening when we find something unusual come swimming towards us on the Kodaikanal Lake, during our last visit in late summer. The climate was quite make feel shivering when we spent some time on the lake bank sipping hot coffee and I was comfort sitting inside the car and watching the lake. There were few others along with us looking at the strange thing with no idea and I could only think of a turtle or river otter, going though the dark element. Suddenly the element rises up to conclude our discussion and wonder what it was. A man stood from the cold water and another one followed him in distance! 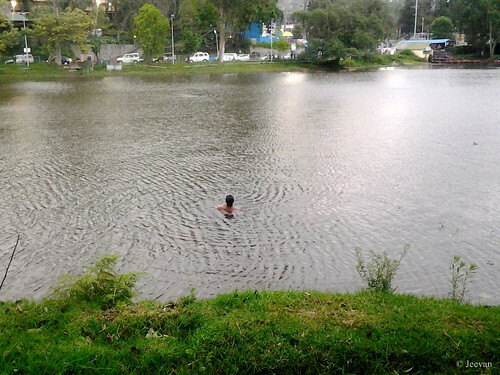 They both were coming from the other bank of the lake, swimming underwater and perhaps it could be a reason to keep away from the cops eyes... because it is prohibited to take bath or swim in the Kodaikanal Lake. Apart keeping it clean, the water is exposed to substances (esp. mercury emission) that are ill to health and due to siltation there’s risk of getting drown in water. The lake is almost fenced already and during my recent visit, I find it fenced quite but the guys had entered the lake though a gap in fence and they seemed coming from our neighbor state Kerala. Everyone was quite awe looking at their daring act and how they survive through the freezing cold water… it wasn't sure they aware about the lake, but got heavy dose of strike from police, later on the bank. We could have seen people entering ice water for challenges in extremely cold countries, but something like this facing in real was amazing! 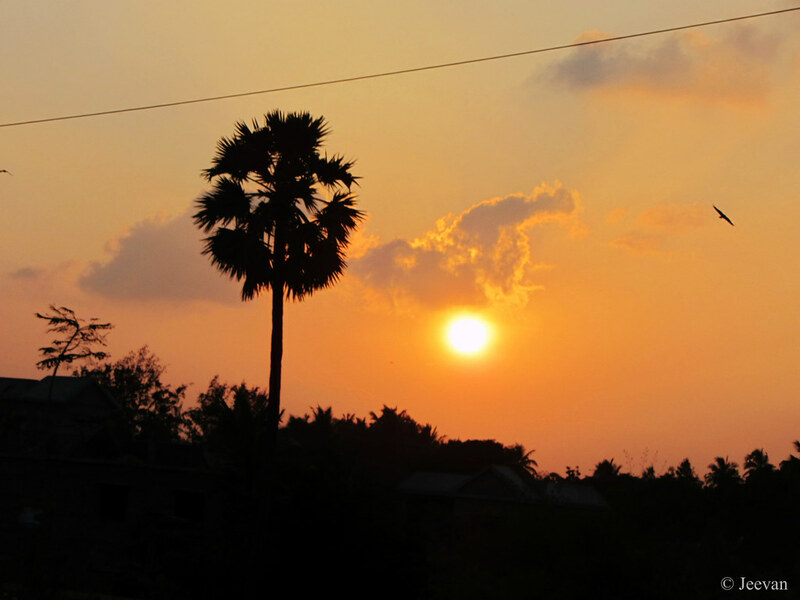 I had a drive up to Mamallapuram on Sunday evening after long time or past summer. I haven’t planned for a drive but decided to go out to beach in the evening and my cousin on his own plan of dropping his grandmother at her house in Mamallapuram enriched my idea of going out. I joined my cousin family, following their interest to accompany me during the ride and living adjacent to ECR (east coast road) that begins at Thiruvanmyuir Bus Depot; and touching the road after 3 month (due to femur fracture) put me into lot of surprise the changes brought alongside the road. 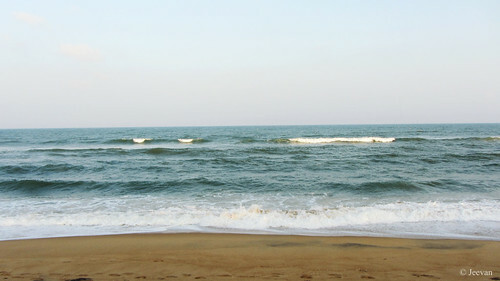 Number of showrooms had emerged either sides of the road, like mushrooms emerging after a brief rain; many villas have also take place on the ECR towards Mamallapuram. Since fracture I couldn't take seat into our SUV due to its height, so we took our uncle’s car and made a pleasant drive into ECR… and I wasn't comfort with my camera to take pictures using this car but my cousin sis took few pictures for me. After dropping my cousin’s granny at her home, we took a brief drive around the Mamallapuram which we sometime used to do while visiting the town. We drew beyond the town and went up to the rear gate of Kalpakkam Atomic Power Station and checked a beach beside a fishing village. Kokkilamedu Kuppam (village) is one of tsunami affected area where NGOs had built number of identical house to the villagers residing very close to shore. 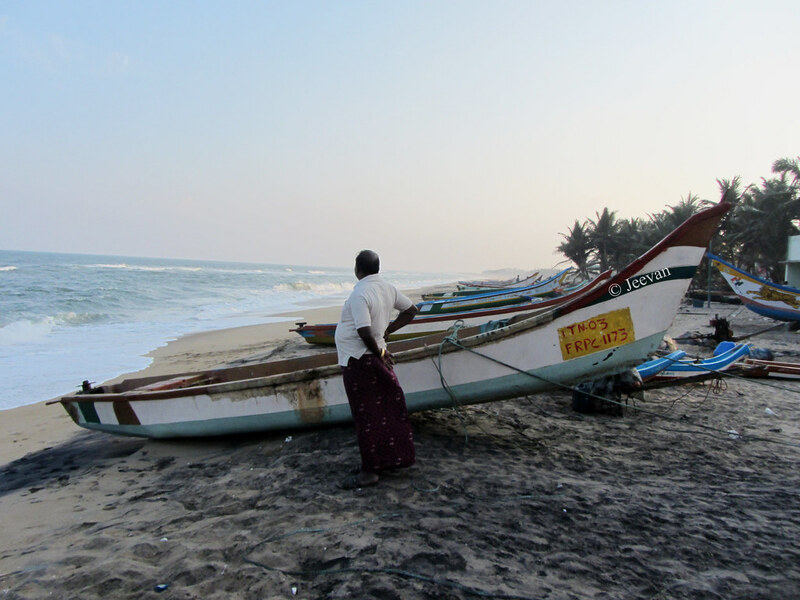 A big wave is enough to touch or test their houses and there were number of boats resting on the shore after week-long fishing. The coconut palms at the distance of waves kissing were pleasing to check and the cool breeze rushing from the sea makes cold embraces. The houses in the village were all built neatly with narrow lanes in-between and each house is left with concrete benches, outside, to sit and relax in evening and there were also few benches facing the sea which I am sure will make it feel pleasure sitting and watching the beach. The village was also laid with concrete roads and interestingly there are three graveyards for this village which I guess must be distinguished regarding their caste and community. Nice the road leads up to seashore to make it possible getting close to it but the environment wasn't clean to spent there more time. 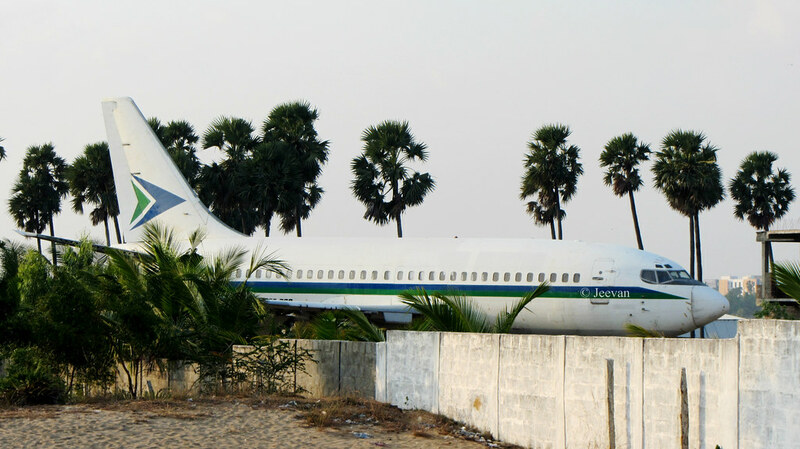 We also come across a big airplane near Five Rathas, which I still have no idea how it should have brought there and why... but each one has different ideas about it and some says there’s a hotel coming up inside the plane or at the premises the plane is parked. I think it must have brought there to support the marine heritage museum that going to exists there soon and a submarine is also on the way to lay there which right now stable at Karaikal port. I still can’t believe how they brought the plane there, because the roads weren't wide enough leading to this place and even if they depart the wings and tail, how comes the big body. But I am excited seeing a plane near! Surprising there wasn't much crowd at Mamallapuram (a UNESCO World Heritage Site of sculptures) being a Sunday and the roads were also unusually less crowd of vehicles and perhaps, absence of many buses on that day could be a reason for the shortage of crowd. We find number of Great Egrets on the Muttukadu backwater, but we couldn't stop and take pictures unlike before since vehicles passing constantly. The day ends with bright sunset for us and the sun was too fast that day rising down to pinkish red without giving a chance to capture in-between trees and buildings. The ECR has become much accident pone there days and we see more than couple of accident that day and I think the barriers kept along the road to control speed were also in a manner of creating accidents. I think the police need to consider alternate source to this to reduce the accidents and the way buses crossing those barriers where threatening! 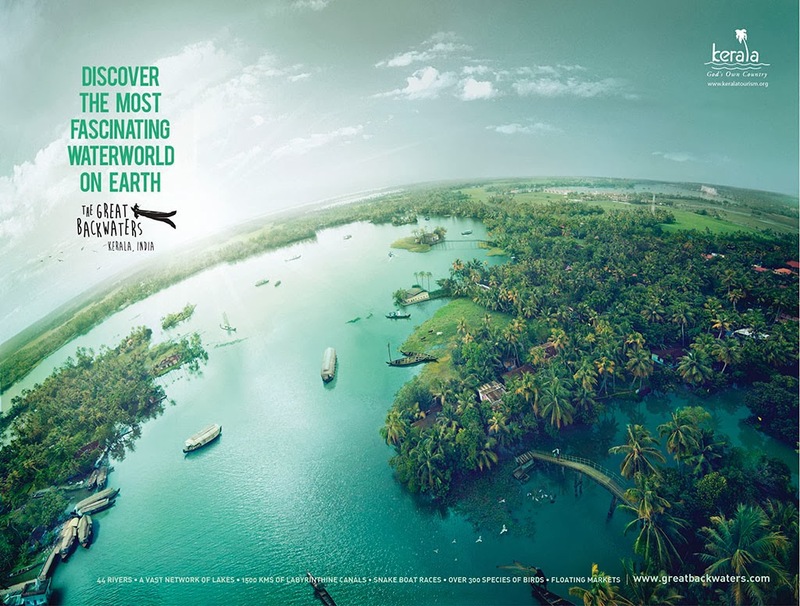 I received an email from Kerala Tourism Board appreciating my blog post (cruising in PeriyarLake) and also to inform me about their latest campaign on Kerala Great Backwaters. I was requested by them to update a post promoting their campaign on unique water stretching of Kerala and newly launched website (http://greatbackwaters.com/) in a fascinating route. 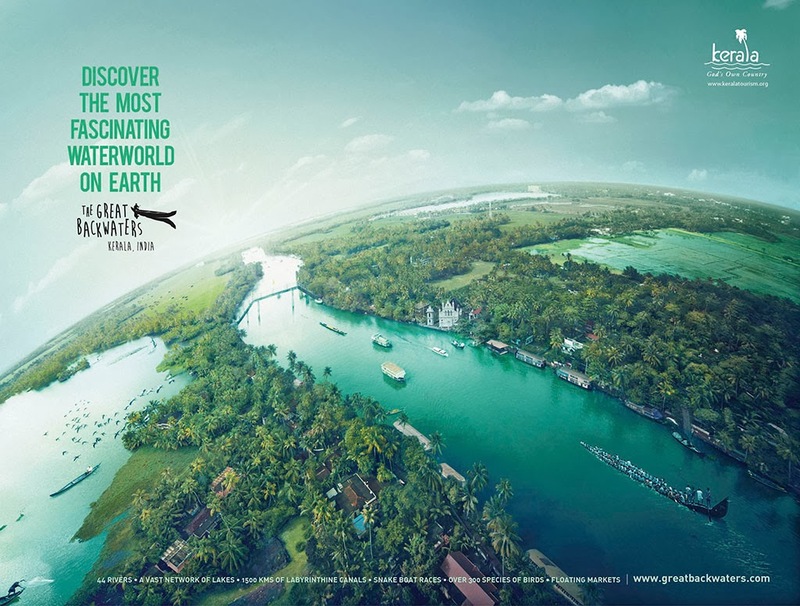 I was truly impressed by their attitude on promoting their water tourism that includes 44 rivers, vast network of lakes, 1500kms of labyrinthine canals, snake boat races and over 300 species of birds and floating markets… showcasing the magnificence of Kerala backwaters. 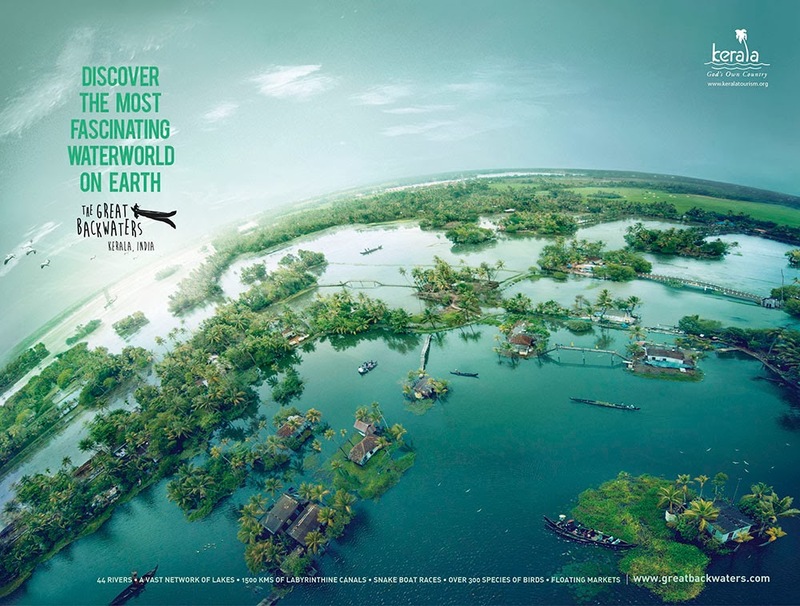 Here are few pictures from their Arial marketing on backwaters and for me Kerala is still a green lagoon I am looking forward to explore more since I were only at boarder level. My desire to visit Munnar has been postponing for last two years for various reasons but my eager only grows every time I miss opportunity. The waterways are not always favor to me, because moving into a boat in wheelchair is not easy task and I wish they make disable friendly everywhere so that I can also enjoy staying in one of the boat houses floating in backwaters. I have visited only couple of places in Kerala bordering with Tamil Nadu; Thekkady and Athirapallai are two natural wonders of lake and waterfalls surrounded by wild flora and fauna. Taking a cruse in Periyar Lake, Thekkady, is exciting one with fascinating sights of wildlife and amusing passing through bare tree trunks, sometime perched by bird of prey. Athirapalli is a beautiful place of height waterfalls on the Chalakudy River flowing westwards on the Western Ghats mountains…. The 80 feet waterfall is also called the Niagara of India and Punnagai Mannan Falls hence the popular suicide scene of the film was shot here. I always wish to visit it again and for me personally more than the waterfalls the way to it was most favorite route, since it passes through Sholayar Rainforest while coming from Valparai. For more detail on visiting the God's own country, pls go here checking their state tourism website!